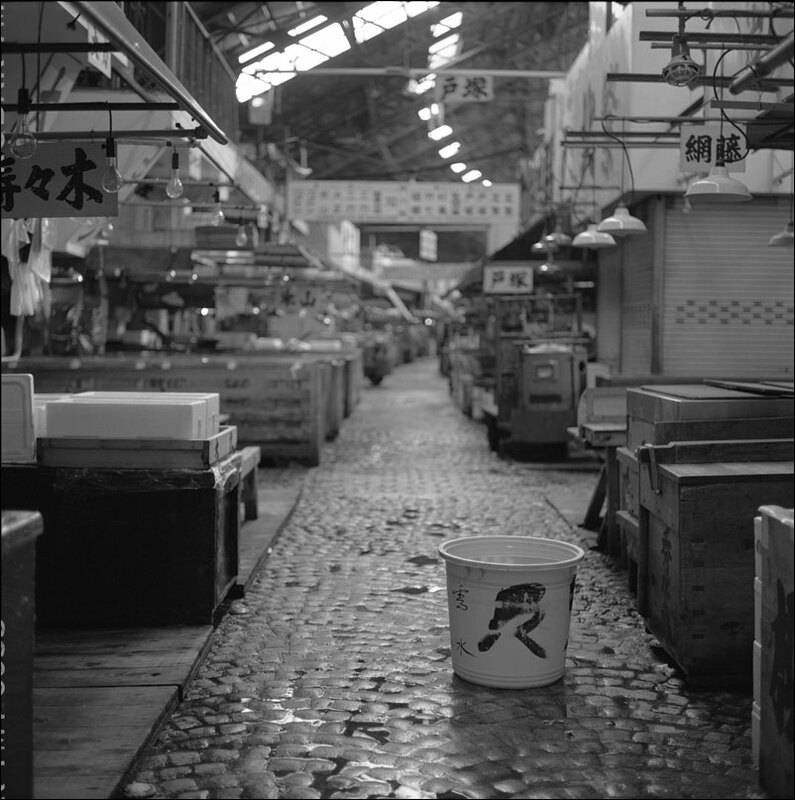 By nine o’clock in the morning, the market is deserted. Everything has been washed down and left to dry. The only sign of life is an occasional cat scavenging for food. 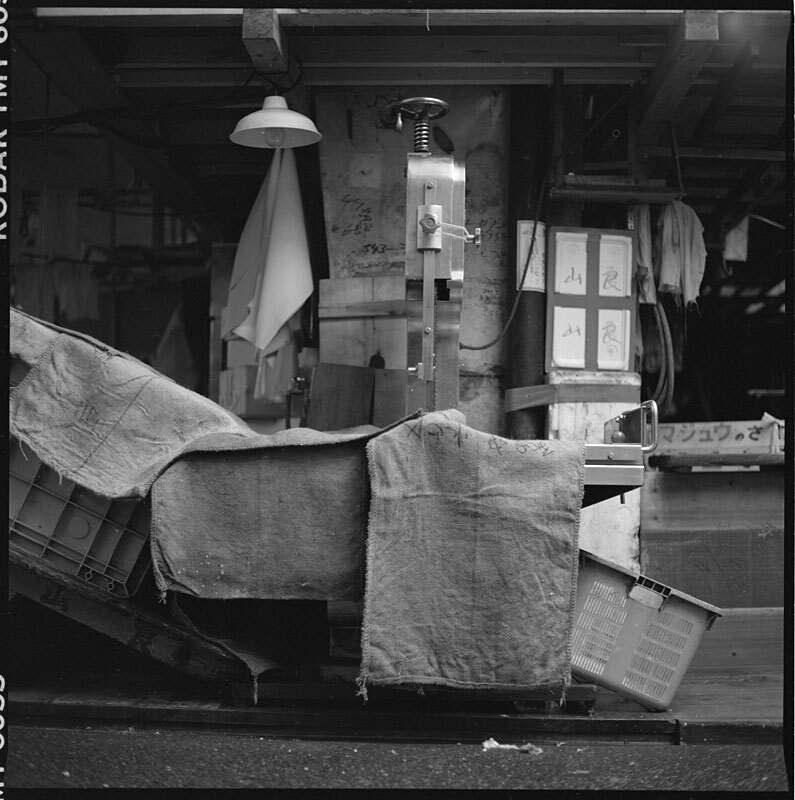 With the surrounding city coming to life with the business of the day, Tsukiji resembles an abandoned factory rather than a vibrant fish market. Click on the image for a larger view. 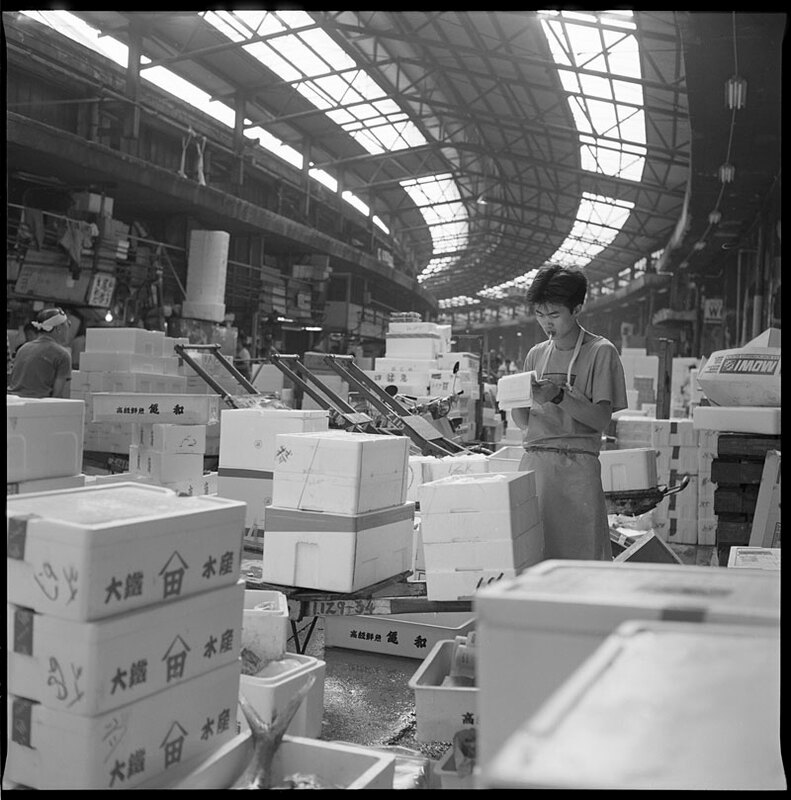 Tsukiji wholesale market, which trades in seafood and produce, covers about 22.5 hectares/56 acres with the fish market taking up the majority of the area. Built on reclaimed land in Tokyo Bay, much of the architecture dates back to its opening in 1935. 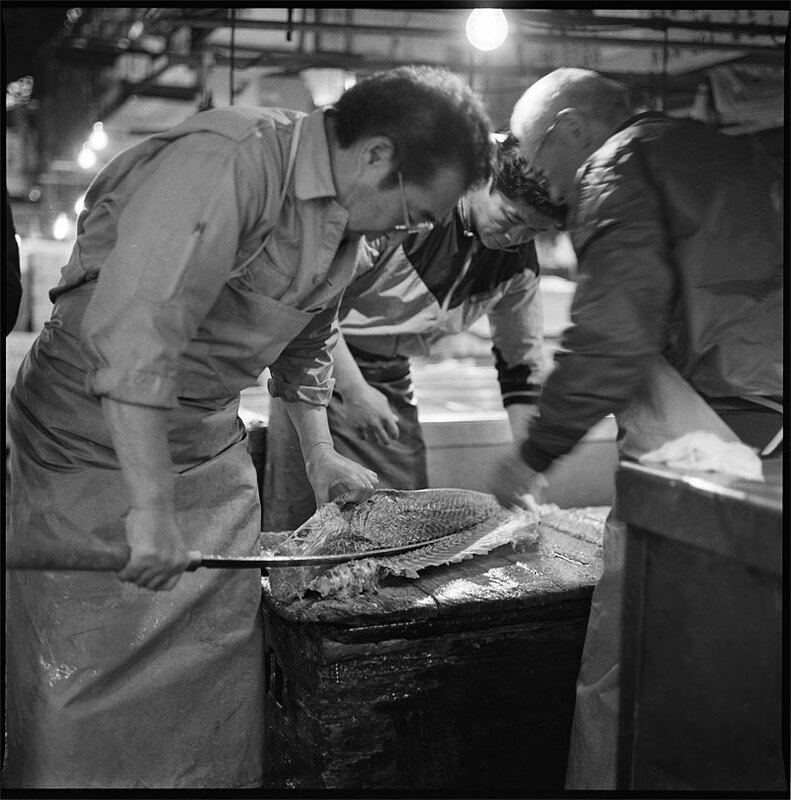 The large, curved structure, which typifies the market, houses the intermediate seafood wholesalers. The auction areas are just outside that on the waterfront. Ongoing renovations have made the buildings a warren of passages and alcoves. Click on the image for a larger view. 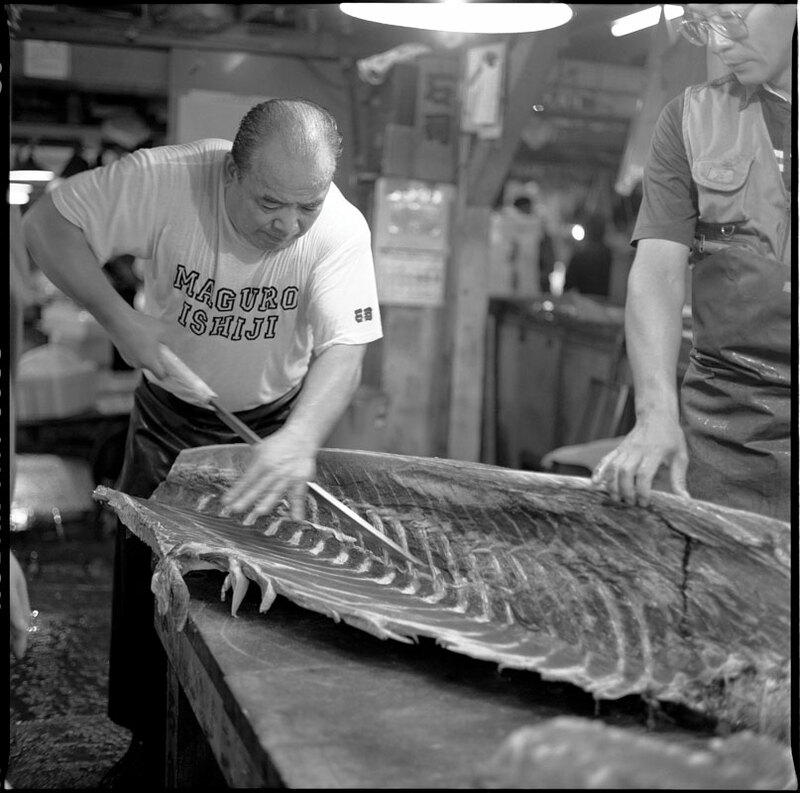 Just after midnight, trucks with frozen tuna roll into Tsukiji Fish Market. They are there for the early morning auctions. When the workers open the back doors of a truck, they pull the fish out onto a large tire on the floor to break its fall. 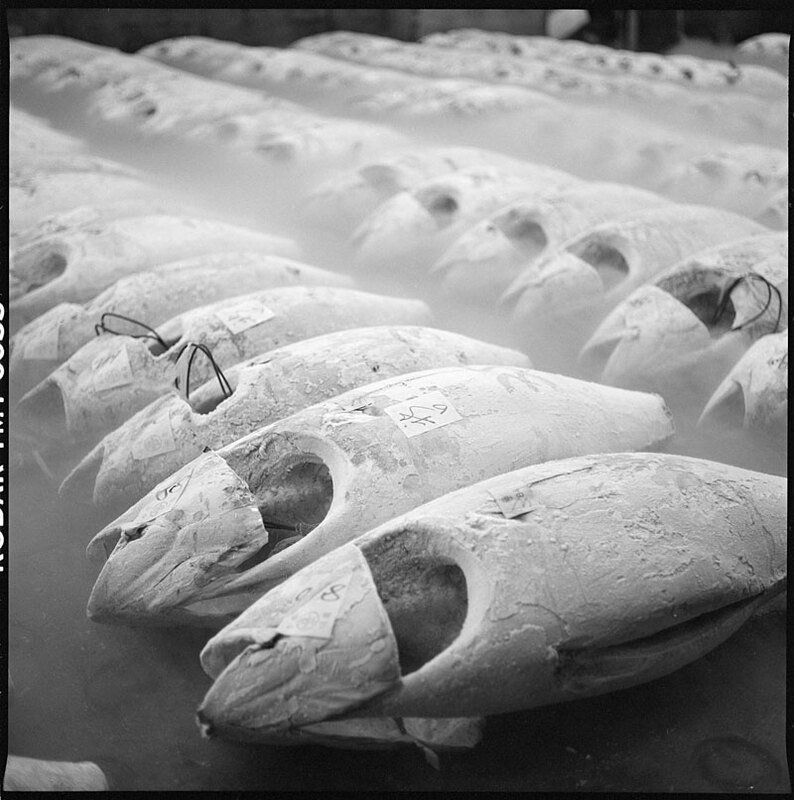 The tuna is then dragged over the concrete like a huge ice cube and placed in orderly rows. One night, I was standing on the wharf between a tuna truck and the water. The men unloaded some fish. They swung the doors shut. The truck slowly rolled forward as if it is was leaving. It stopped. Suddenly, the truck roared into reverse and shot backwards. The driver hit the brakes and the load of frozen fish in the back of the trailer hurtled toward the closed doors, hitting them like repeating cannon fire. The men swung the doors open and continued unloading the cargo. Although, when it happen, I was not thinking about what they were doing. I was wondering which was the better choice, getting run over by a fish truck or jumping into Tokyo Bay. Click on the image for a larger view. 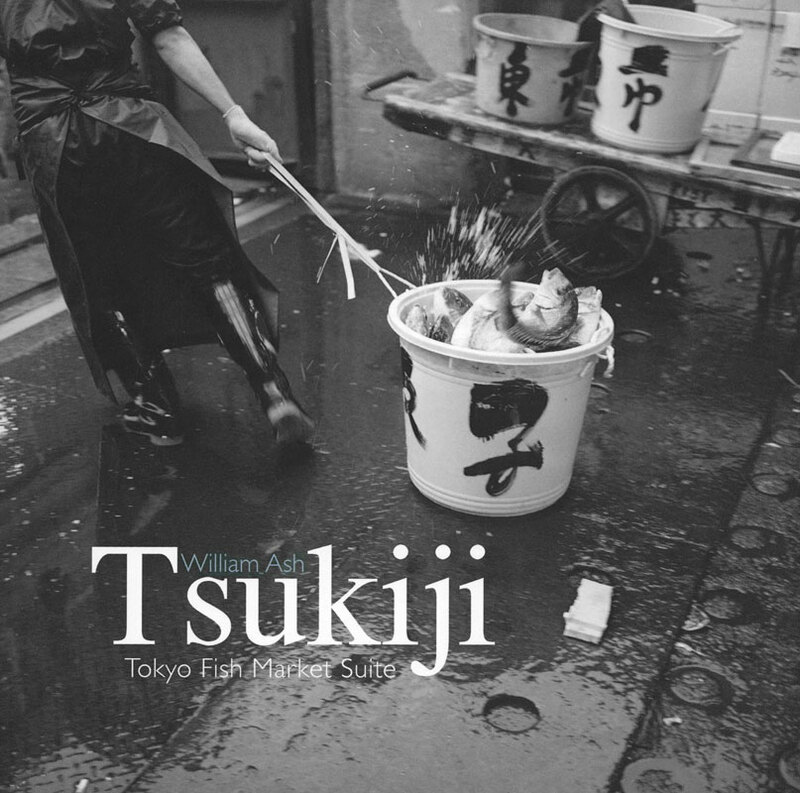 Just a stone’s throw from the center of Tokyo is Tsukiji Fish Market. A small city unto itself, this area has a life and vitality that is not really reflected in the offices of the metropolis. Click on the image for a larger view.